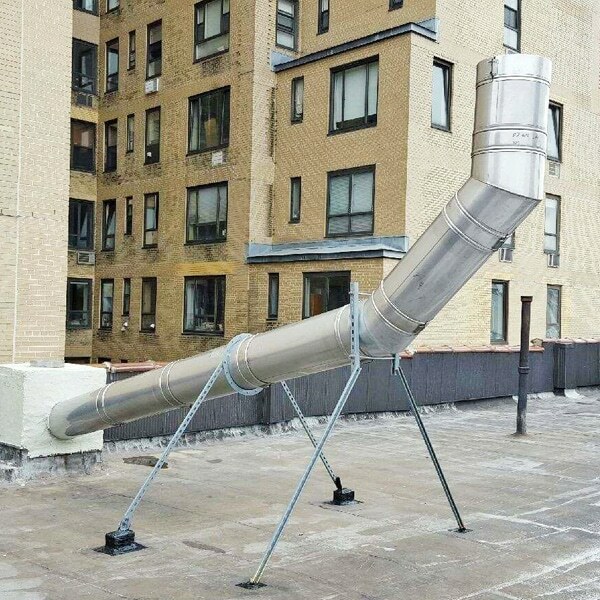 Flue Repair and Lining Systems | Flue Tech Inc.
A damaged flue or lining can be both hazardous and inefficient. We offer a number of flue and lining repair solutions. Flue Tech technicians use a variety of techniques and systems to repair or replace your flue or lining. Damaged flues can cause fire and structural hazards and draft problems. We have the experience and training to properly assess your flue issues and offer the best solution with reliable and professional results. Chimney re-lining is generally needed when a masonry chimney has been damaged, is unsafe or unrepairable or the appliance being connected to the chimney requires a liner. We offer several types of lining systems. A stainless steel chimney liner improves draft by sizing the liner to the appliance, creating hotter core temperatures, improved safety, easier cleaning, and longevity. We can custom make any diameter or length. Our liners and connections have lifetime guarantees. These systems can be wrapped with ceramic fiber blanket insulation or they can be surrounded with poured insulation. ProForm Chimney Restoration is a non-destructive chimney lining system which conforms to any shape, size or length chimney. ProForm Chimney Restoration is a corrosion-proof, flame and heat-resistant, airtight liner tube made of a composite material with the rigidity of steel but without seams and at a fraction of the weight. Dual Fuel-Proform chimney liners are installed in masonry chimneys used to vent gas or oil appliances only. Golden Flue is the most advanced liner system known today and the best cure for any chimney problem. It is also the best value for the money spent. We use Golden Flue UL listed and Warnock Hersey approved high temperature cement that eliminates most heat transfer, which is the most common cause of structural fires. Golden Flue withstands temperatures in excess of 2100 F, and the product’s flowability makes it ideal for sealing voids and cracks. The Golden Flue cast-in-place lining system creates a round, smooth, insulated, solid structural supportive flue system, and the installation carries a twenty year guarantee. With a Golden Flue cast-in-place lining system, flues are insulated, keeping flue temperatures higher, which creates better draft and less condensation. Thermocrete is a premium liner for flues and chimneys. It adds insulation that prevents condensation and reduces creosote. This non-destructive flue lining system is installed from outside your home, preventing any changes to the inside or the masonry of your chimney. The system works by placing an inflatable form inside your chimney. Thermocrete ceramic is pumped into the chimney around the form, filling any gaps or cracks. After the ceramic is set, the form is removed. Thermocrete is a fast and reliable flue lining option. Solve your flue mortar joint problems with this pressurized flue joining repair system. During original construction, it is not uncommon for masons to improperly align the flue liners or neglect to fill the joints between the flue liners with the appropriate refractory mortar. Standard mortar in the joints of flue liners cannot withstand the adverse heat and moisture conditions present in a chimney environment. The result of using standard mortar is rapid deterioration of the joint, ultimately leaving dangerous openings between the flue liners. Our Flue Tech technicians are experienced in treating these problems thoroughly and easily with our pressurized joint filling system.